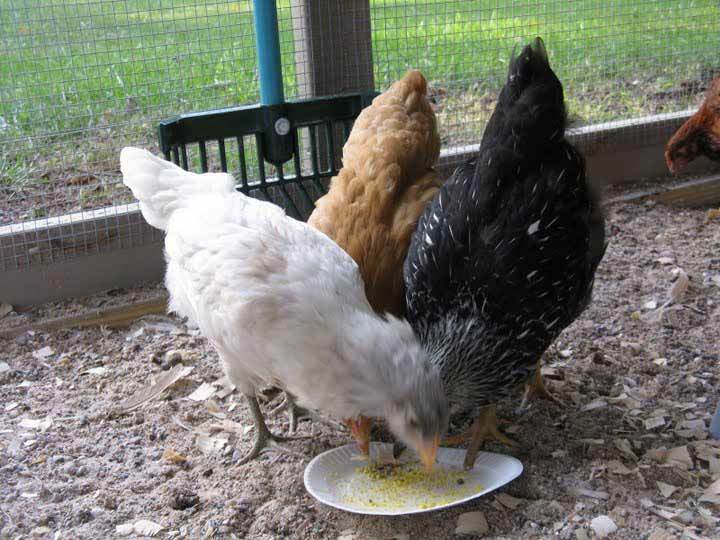 The summer of 2009 I decided to start on a new hobby and have some hens as "pets with perks"! To prevent overwhelming my neighbors and my ability, I ordered 5 day-old chicks from My Pet Chicken. 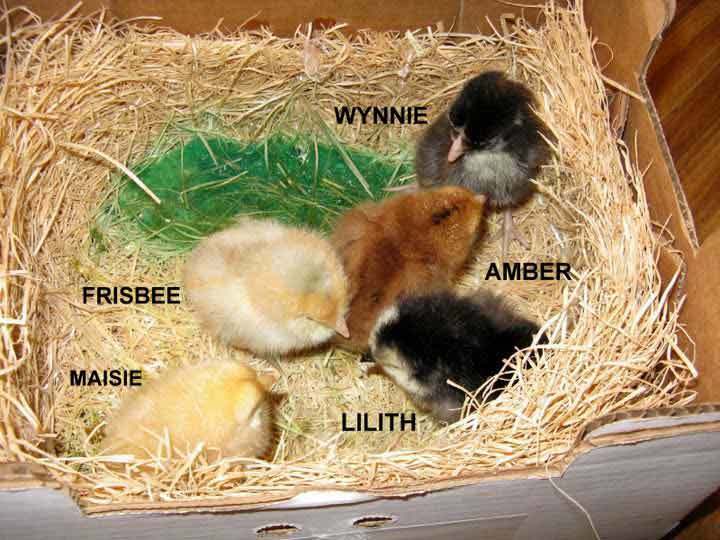 I selected one each: Rhode Island Red (Amber), Black Australorp (Lilith), Silver Laced Wyandotte (Wynnie), Buff Orpington (Maisie), and an Easter Egger (Frisbee). The chicks were hatched on August 17 and my adventure began at the local post office two days later. I set them up in a crate in my garage and my husband and I started on the construction of what was to become their home. After studying books and of course the BYC forum for all the advice and tips and ideas I could cram into my brain, I drew out a sketch of my plans. After many trips to Home Depot and the bank and after spending all my summer weekend days sweating instead of kayaking, the hens are all happily settled in their new home!! 1. Aesthetics - Want to keep the neighbors happy so wanted something that wouldn't make the backyard look like a ghetto and would be easy to keep clean so flies and odors would be minimal. 2. Security - Although our property is fenced all around with a 4' high chain link fence, I have 4 dogs and 3 cats and all of the normal wildlife predators including coyotes, bobcat, raccoon, opossum, skunks and hawks and hopefully no other creepies that I'm not aware of lurking after dark!! 3. Drainage and Ventilation - There is an area of the yard that water flows across during very heavy rains and I needed to address the very hot afternoon sun that hits our backyard. 4. Clandestine - I wanted the coop to be as unobtrusive as possible and chose all hens and kept my fingers crossed til maturity. I do believe MPC successfully sexed all 5! At 13 weeks they do seem to be full of all girl cackles. 5. 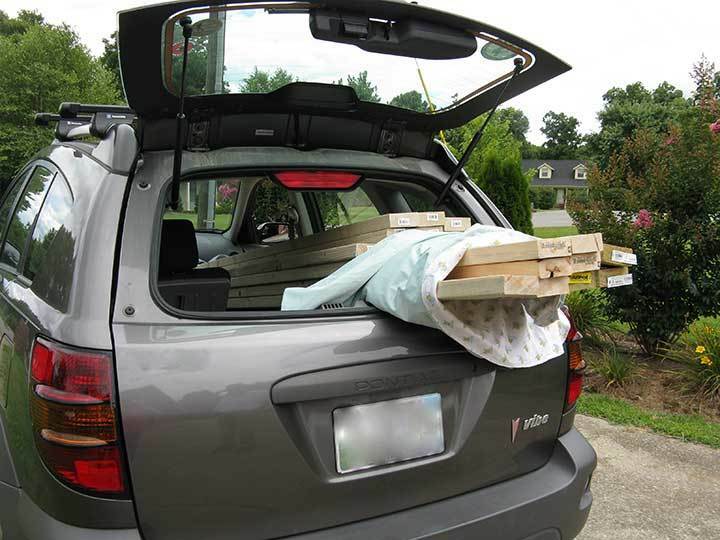 Construction materials - I wanted the construction to be something my husband and I could handle on our own, with materials readily accessible, and able to transport with only the aid of one small Pontiac Vibe with a luggage rack. So with notes, lists and checkbook in hand, we headed out for our first trip to Home Depot. Here is the first load of many in the construction van! First we laid out the materials for the start of the walls. Looks like the crew has quit and wants to play. Ya just can't get good help anymore! Ah good.....the job foreman is here. Now work will get underway again! 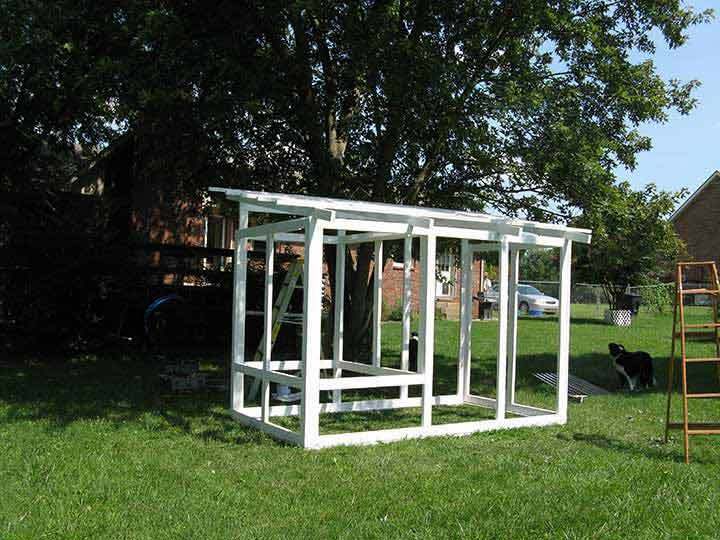 Now the frame has been painted with primer and the whole thing moved to a new location. What fun! Here the smoke gray fiberglass roof panels have been added. They are called SunTuf and were one of the most expensive parts of the design. They were chosen so light could filter in but they would keep it cooler in the summer. Puzzle pieces being cut and painted assembly line style. Hatch windows open for ventilation. There is also an opening in the roof of the coop for hot moist air to escape upward. The lower panel is for gathering eggs.....someday! 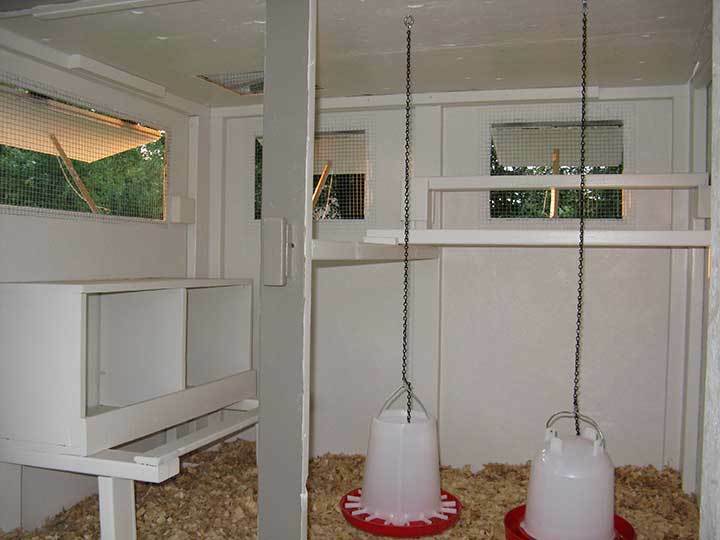 The interior with roosts, nesting boxes and feeder and waterer. The roosts weren't planned out very well and there was no poop board under them so this configuration does not work very well as they poop over the feeder. This will be reworked in the spring but for now, the feeder hangs under the coop in the run area. 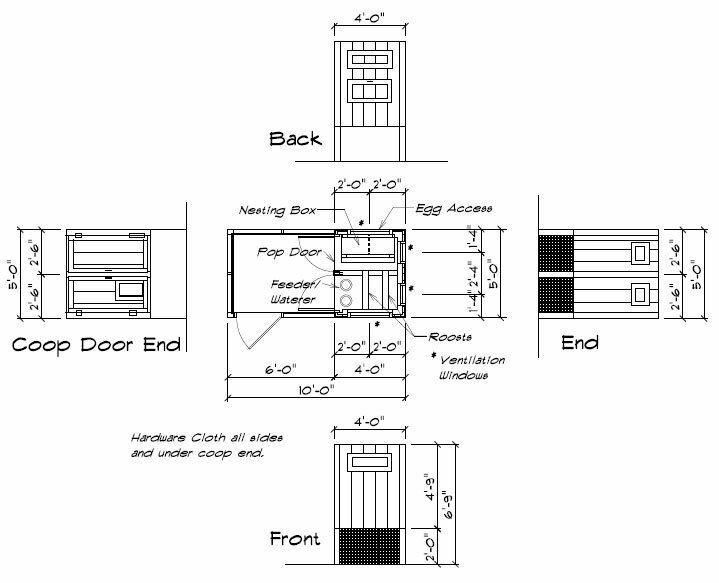 Here is their pop door with ramp. The ramp is painted with a sand mix in the paint so it is not slick. I have also since added a pulley for the pop door so it can be opened and closed from next to the egg gathering hatch. Here the coop is electrified with 2 strands along the perimeter. There is now a strand above the top as well. There is also hardware cloth extending a foot and half out on the ground with a layer of dirt and mulch over it. .....and the residents on their day of arrival. It will be several weeks before they move into their new home! Here they are on one of their early roosts. They seem to love their coop and put themselves to bed all by themselves every night! Here they are at 8 weeks having a snack in their run. 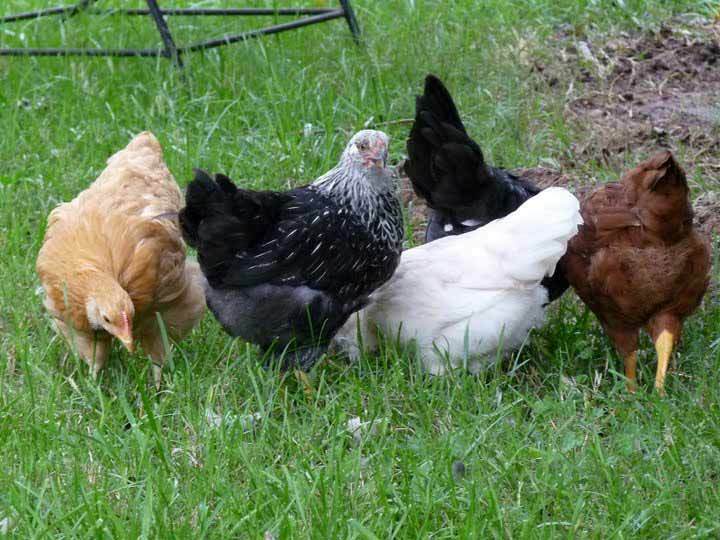 And here are all five of them enjoying some free time out in the yard. They are growing sooooo fast! 1. Keep the coop in the original spot rather than deciding to move it. I could have left it where it was and the drainage would have been far better. Don't tell DH but I may move it back on pvc "rollers"! A better location would work out better with our new garden area too and one main fence could have kept the dogs out of the garden as well as from running circles around the coop. 3. DEFINITELY MAKE IT BIGGER!! The roosts would have worked out much better with more room. 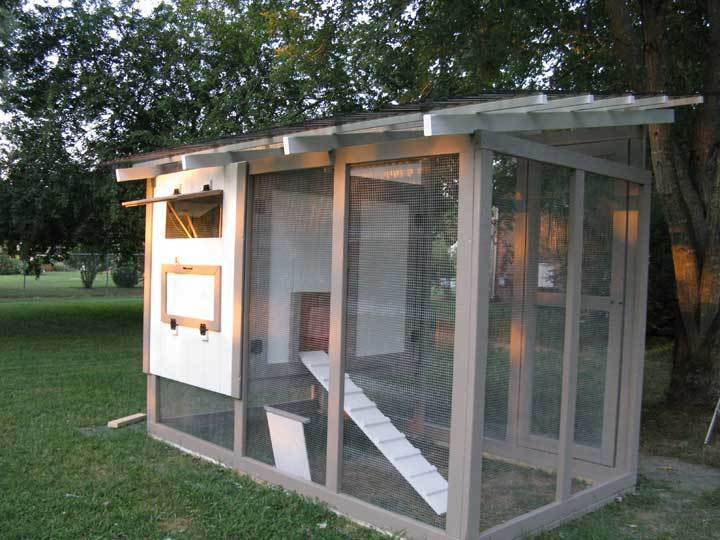 I don't know that I'd want more chickens (hahahaha sure I would) but a little bigger coop would have been nice! 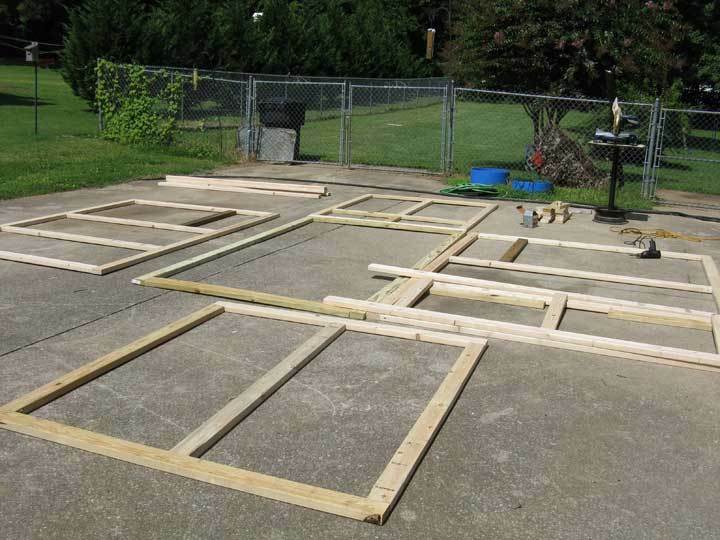 The layout of the walls using 2 x 4’s. Pressure Treated 2 x 4’s were used for the base pieces that are in contact with the ground. 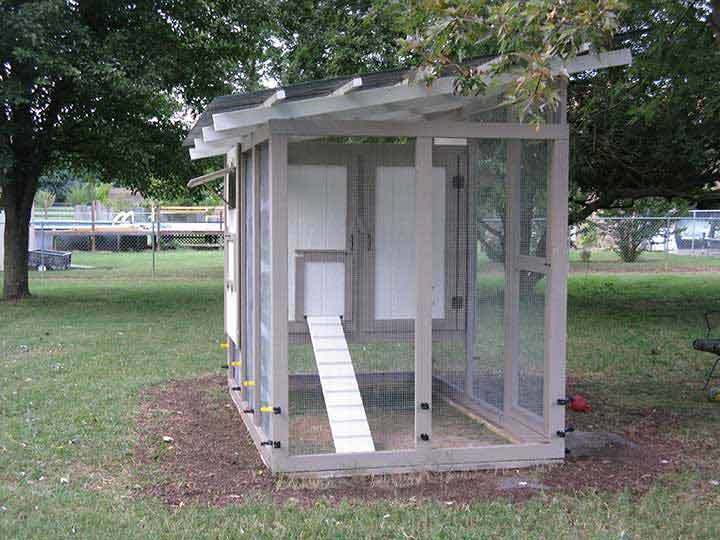 The basic dimensions: 5’ x 10’ with the enclosed coop end at 4’ x 5’. The floor of the coop is offset up approximately 2’ and the roof slopes from 8’ down to 7’. The roof rafters are 2 x 4’s with 2 x 2 strips running the long way. The SunTuf roofing panels are attached by screwing through the panel into a plastic mounting strip that has been fastened to the 2 x 2 strips. 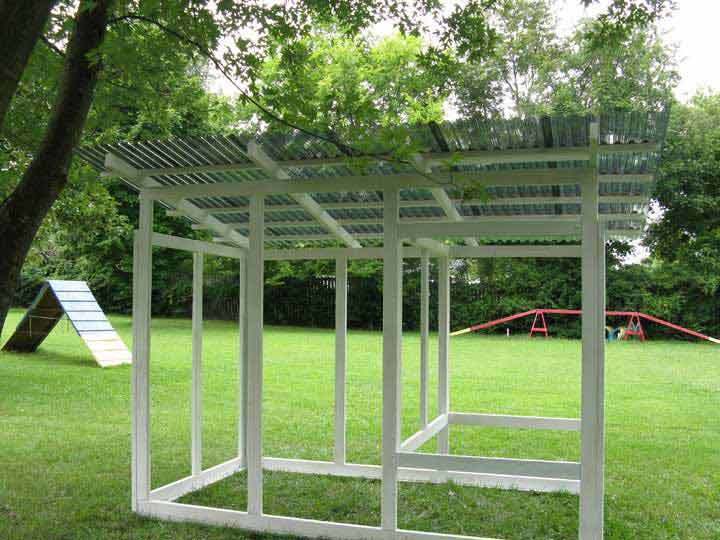 The panels are polycarbonate corrugated panels and carry a lifetime warranty and are virtually unbreakable. 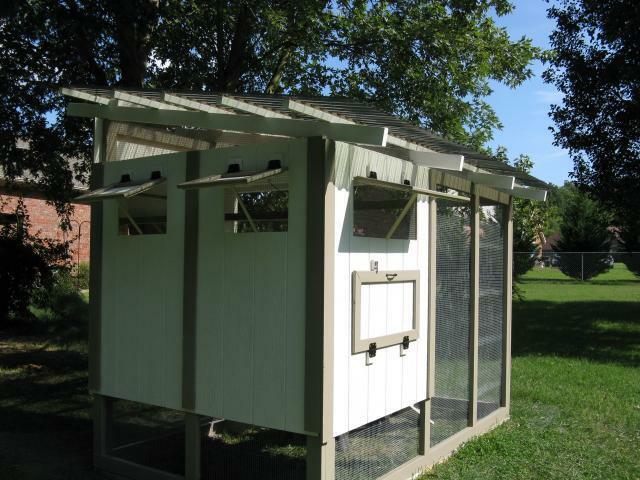 The roofing was installed with a foot overhang on all sides and all of the open areas under the framing are completely enclosed with hardware cloth to prevent climbing predators from gaining access to the coop or run. The siding, window hatches, and trim pieces were all cut and installed. The trim pieces used are 1 x 4’s and 1 x 3’s. The hatches for ventilation are hinged at the top so as to prevent rain from blowing in while still being able to remain open. All hatches are covered with hardware cloth to maintain a complete barrier to predator access. The floor and ceiling to the coop area are ½” exterior grade plywood, primed and painted with semi-gloss exterior white paint for ease of cleaning. Hardware cloth is attached to all of the run areas and also a wide strip is layed horizontally on the ground running under the base and out approx. a foot and half around the perimeter. This has been covered with dirt and mulch which my Border Collie has done a good job of scattering as she races around and around the perimeter of the coop! Luckily the chickens pay very little attention to her as I guess they feel totally secure in their enclosure! With very little exception, the entire structure is screwed and/or LiquidNails glued together rather than nailed. 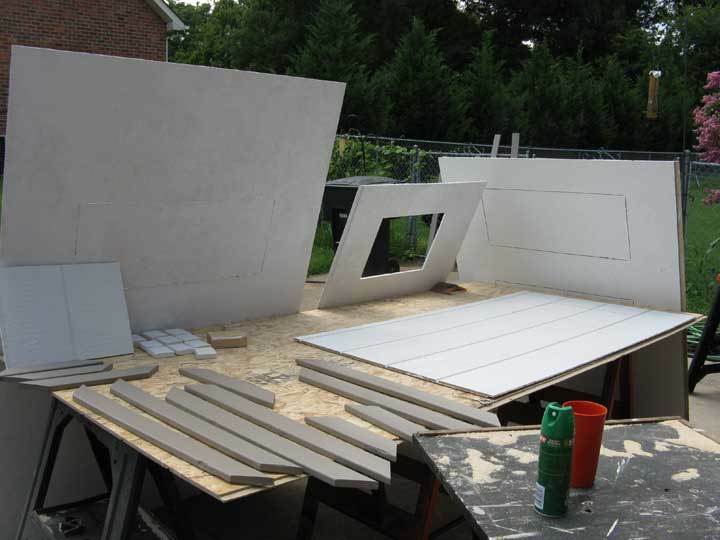 The 2 x 2 roofing strips were nailed down and the trim pieces were glued and nailed. The perimeter of the coop/run has 2 strands of electric fence near the ground and one strand around the top to aid in stopping predators from trying to dig and/or climb. The ramp has cross strips attached and also is painted with a paint/sand mixture to keep it from being slippery. The screen door has a spring in addition to a latch to keep it closed at all times. 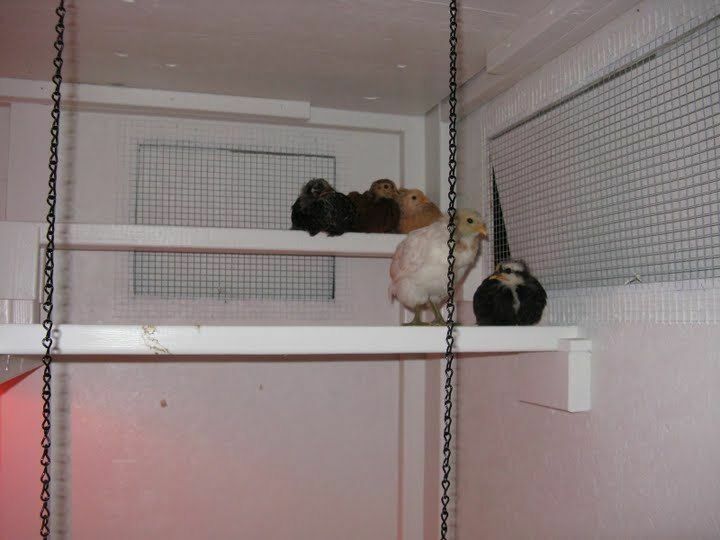 The pop door has a pulley system attached and mounted just outside the coop near the nesting box access hatch so the coop can be opened and closed without actually entering the coop or run. This makes it nice in the mornings when I open the coop right before I leave for work and don’t have to worry about taking little goodies in to the office on my shoes!! Sand and poop can cling and travel a LONG way! This is a very simplified outline of the steps we followed in building our coop/run. We, or at least I can say I, had a great time designing and building it. My husband was a tremendous help even though it wasn't his idea of the way he wanted to spend his summer weekends. BUT he did it for me!! It would have been quite the challenge to build on my own but then again....I'm pretty stubborn! I hope you can gain some ideas that will be useful for your project as well. annfosnacht, HERSHORTNESS, laurenjenny and 13 others like this. Great job on the coop. I like that you painted the inside white. It seems to brighten it up. I left mine unpainted and have considered adding a few tiny solar lights, as even during the day it is pretty dark. Or adding another window for more lighting. In any case, it looks very very much like the one I just built. The inside of mine is a little bit different. "Nice Coop - Lots of Helpful Notes!" This is a very helpful article. The instructions are all there, right down to an well-diagrammed diagram and an actual parts layout. The pictures are very supportive - and the captions will give you a chuckle! Nice looking coop with an informative description of build. Bonus as it has plans! Wow ... at first glance it looks almost like our coop design but with the roof slanting the opposite way. I like the design, but like you, would definitely make some engineering changes. Looks good! I suffer from TMC - too many chickens. I have already exhausted my husband favors for the year so I'm going to have to build the next coop myself. Which is like saying "I'm going to build a rocket to take me to mars" but with these basic ideas (and some surreptitious help from a neighbor or two) I think I will be OK Thank you!! How about going to local auto parts store and get 2 big plastic funnels. Trim the spout and thread the chains through them to cover the feeders. To fill slide up. I have feeder in tight coop and use funnel to keeps sparrows from landing on edge and soiling the feed. Your coop is very nice but i learned we never have it big enough. Love the design, that you painted it before assembly, and the way the windows open up. The picture of the chicks on the roosts is hilarious- anyone stressing over how much room for a hen on a roost will tell you that no matter how many rails or how much room we allow, they just seem to want to pile up on each other! I am looking to replace my ramp and I am going to try the sand / paint mix for traction. Well done! I love their names! Frisbee is such a cute name! The coop sounds like a really cool idea & I love the shade of green. The inside is also gorgeous! You did a really nice job! Nice coop! 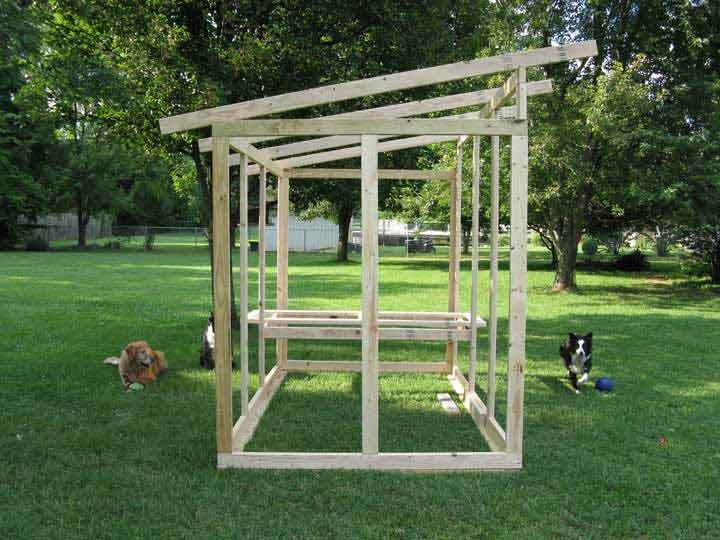 I am a retired carpenter and have built similar coops for my birds. Your design is solid, and can be enlarged for future flock expansions. My most recent coop of this configuration had a 4'×8' elevated house with a run 8'×17'. I use corrugated barn material for my roofing, and like yours, roofing was largest expense. Great job sharing your plans, I'm sure many will appreciate the design and its convenience. We LOVE this coop! We are starting to build ours and wanted to ask what is it you used for the siding? Is that wood paneling? i LOVE this! 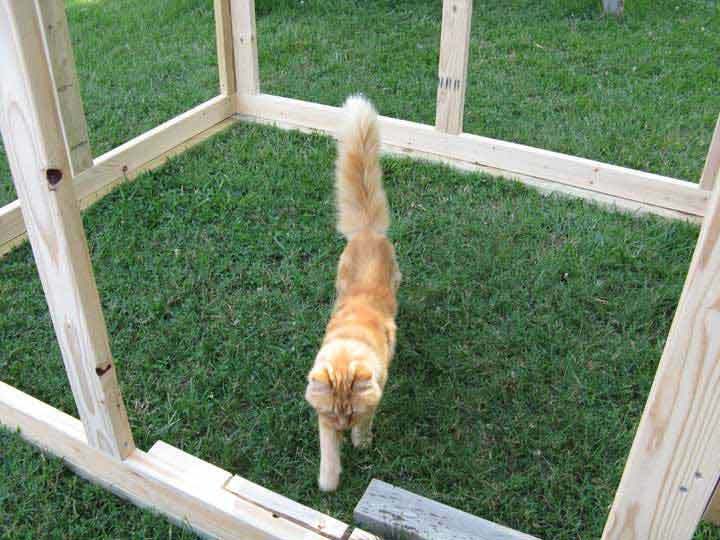 what are the total dimensions or the coop and run combined? Of all the coops my husband has looked at, he is always comes back to this one. He really likes the design and is going to base our backyard coop off of it. WoW! Very nice set-up and Cute!!!! Looks great. I think you could build poop trays underneath the roosts. 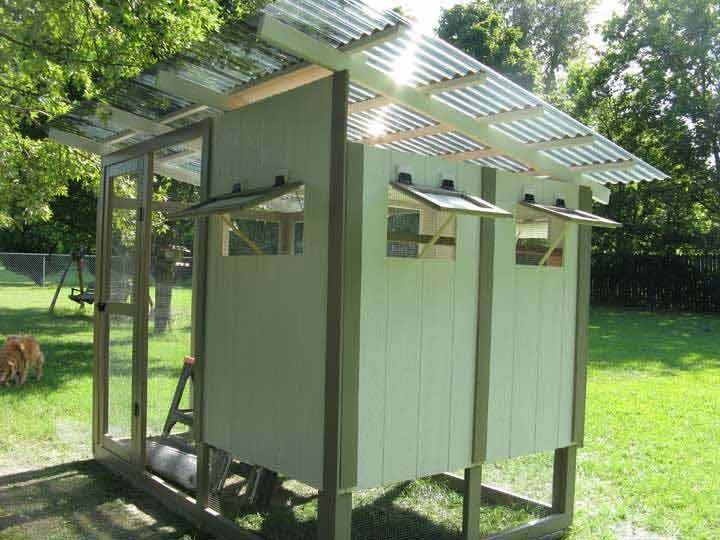 (Use 3/4" plywood and paint; build it and paint it outside the coop; let it dry well; then install and fill) I would fill them with Sweet PDZ. Then just scoop the poop! Much less cleaning and even smells much better! I love your coop. Can you tell me the paint colors you used? It looks different depending on the picture. I wanted to use something similar, but can't quite get the colors right. i'm making my coop like this!!!!!!!! Really love this coop. A little expensive but if i used wood i have allready that would probly cut costs down alot! Thanks! I didn't keep up totally with cost but I believe around $1100. I by choice did not use the best dimensions for the best use of materials so I knew there would be some waste. I also chose an expensive roofing material but have LOVED IT! As for the electric fence, I never got it running very good and it seemed to sometimes shock and sometimes not so my little devil dog Jesse (Border Collie) pays NO attention to it and constantly does her job of running around and around the pen! Our yard is fenced with chain link and the whole coop and pen is predator proof so I don't have the fence plugged in anymore. I think overall our problem is with the ground rod and that is why the fence never worked very well but as I don't really need it, never tried to get it right. Those ground rods are EXPENSIVE and hard to drive into the ground! As many on the forum have and will point out use hardware cloth! I don't even close the pop door at night in the summer as I feel with the whole thing being totally enclosed with hardware cloth, there's no need. I love this design! (thanks for the edits/helpful suggestions. I raised chickens when I was a kid..luckily our property already had a chick and a chicken coop already on it. I live in Tucson, AZ and this is exactly what I've been looking for. I've recently started "project self-sustain" and chickens are part of the plan. Already have the organic garden. If I may be so bold...approx. how much $? coop looks AWESOME! any idea what everything cost? especially the electric fence, that's a great idea.